When a hole is drilled in the ground, lot of things happen. It will collapse and deform in various ways, e.g., swell, washout, you name it. If the hole is in good shape we can “run” logging tools in the hole to measure and confirm the lab measurements we are getting on the cores. Data from the tools are very useful because they are in situ measurements and usually quite reliable. They can also be used to fill in gaps in our knowledge just in case we did not get good core recovery at a certain depth. Plus depending on the tool you run, you can get other measurements that are not made in the lab, e.g., stress orientations, anisotropy (fancy word for properties changing depending on direction), even fluid samples. 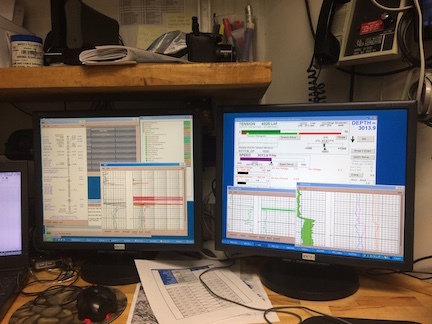 There is one person onboard, Clay, a Wireline Field Engineer from Schlumberger, who helps us with all of this. Here is a pic showing the insides of the cable attached to the downhole logging tools (hepta-cable which has 7 electrical conductors and two layers of armor on the outside). This cable sends the data back up to the surface. The other pic shows Clay’s office, where he monitor’s the logging, including the progress of the tool string as it is lowered down the hole to make sure it does not get stuck. To imagine this process think Jean-Luc Picard and Starship Enterprise just not that glamorous, but it does have a hot microphone to the guys working the winch. The tool string itself is rigid and is built up of different tools put together in a specific order, sometimes with spacers between tools to make sure that, e.g., Tool A is not influencing the readings of Tool B. The tool set we were using is called a Triple Combo. Getting the tools down the hole took a lot of starts and stops because of obstructions and careful monitoring to make sure the cable does not bunch up or get bent in a way that could damage it. Every once in a while the bottom of the tool string can’t go any further and the tools need to be brought up about 10 m and lowered again to try to nudge through the blockage. A decrease in tension at the end of the tool string and speed of descent are usually good indicators of an obstruction in the hole. Different tools measure rock density, natural gamma radiation, diameter of the borehole, resistivity and magnetic susceptibility.